Spending too much time grading? With constant meetings, conferences, growth charts, progress reports, collaborative planning, curriculum writing, and everything else on their plates, it’s amazing that teachers find any time to grade. Before moving to a lower grade, I taught high school for 8 years, and that often meant 150+ students, 5 classes to prep, and no time to do anything. Here’s what I figured out to streamline the grading process in my classroom. It took me so many years to be okay with this, because I just felt like if I didn’t give a grade for it, they wouldn’t do it. Sound familiar? Picture this: I was teaching 150 students, giving weekly quizzes, grading bellwork, grading homework, and then trying to plan engaging lessons. On top of that, we were discouraged from giving zeros, so I was following up with students who were not doing their homework, almost chasing them to get them to do it. There was just no way to get it all done, and I was at the end of my rope. Then, a colleague suggested I stop grading homework. My reaction : WHAT !?! If I don’t grade it, they won’t do it. Well, guess what? They didn’t stop doing it, because after I stopped grading homework, their grade was more dependent upon their understanding of the material. If they didn’t take responsibility for their practice outside of class, they wouldn’t do as well on the assessments, and their grades would reflect that. Everyday during bellwork, students would put their homework on the corner of their desks. I like to make homework packets, so they would just open to the page they had completed. I would take attendance and then pass through the room stamping their completed homework. We would take a few minutes to correct it together, and then I would pick up the packet at the end of the unit. They would get a few points for completing it outside of class, I would get more free time, and on top of it all, I could offer immediate feedback and answer questions on the homework daily. Guess what else happened? Their quiz scores got better! When you correct papers, do you grade each and every mistake? 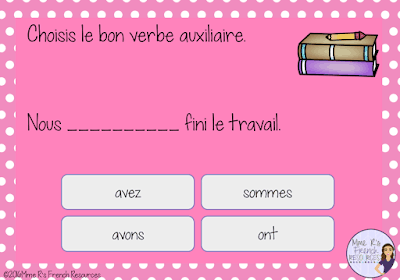 Do you correct a verb conjugation even though your students are not writing at that level yet? Do you feel the need to edit every sentence on the paper? Stop! 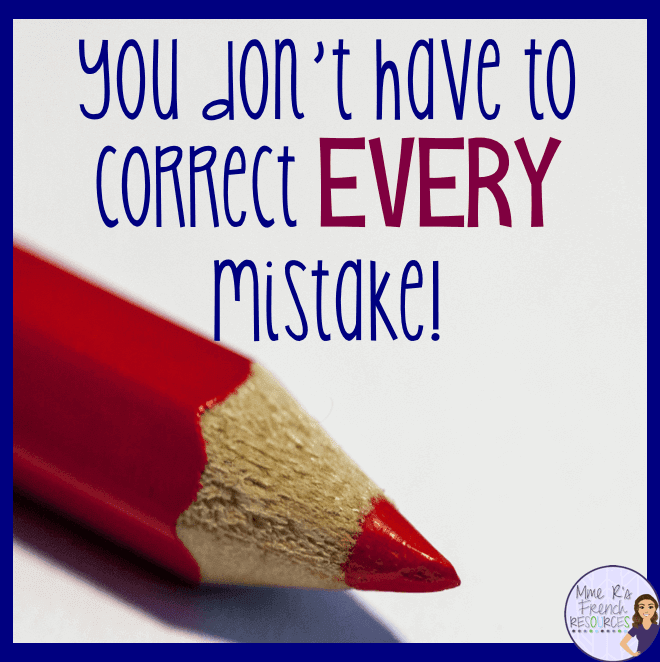 Not only is it time-consuming, but you are making corrections they won’t even understand. I get it, because I do the same thing. Sometimes I would correct so much that I felt like a copy editor, and guess what… they made the same mistakes the next time, because they weren’t ready to learn that skill. Take a breath, put down the red (or pink or purple or aqua) pen, and only make the corrections for the skills your students are practicing on the assignment. If you haven’t taught a concept, is it going to benefit the student if you correct the mistake? If not, let it go. 3. Have students peer edit first. 4. Schedule assignments that fit with your schedule. If you teach multiple levels, look at your schedule as a whole when assigning projects, big assignments, or a long test. You should plan to collect only the work you can grade before losing your sanity. It is okay to collect essays from your French 4 one week and to do some review with French 1 so that their test doesn’t fall on the same day as that essay is due. 5. Use apps that are self-grading. Students love their phones and tablets, so have them practice with apps that check their work. 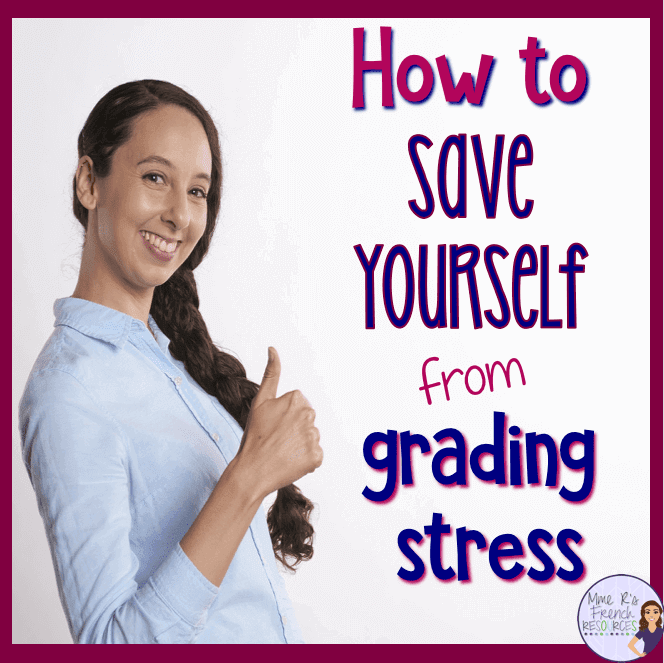 You’ll have less to grade, they’ll have more fun with technology, and it might even touch a learning style that you would not have reached with a paper-pencil homework assignment. 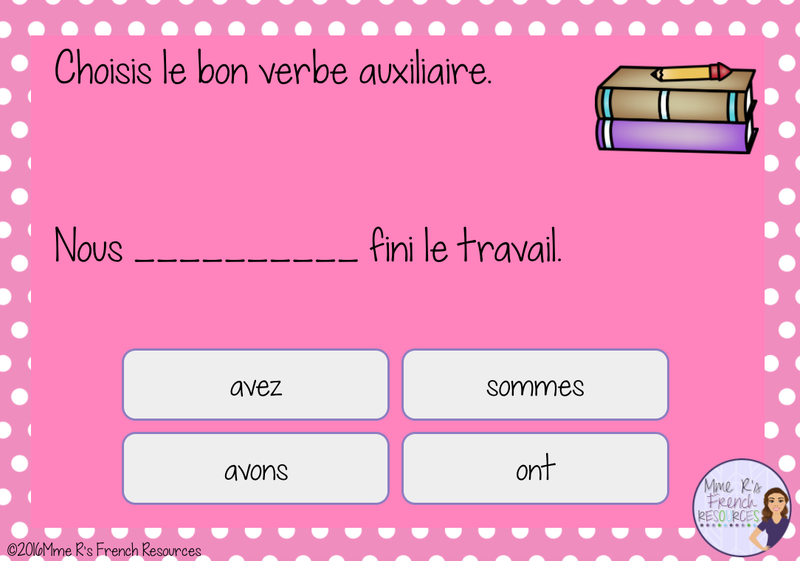 These digital task cards are self-checking, fun, and provide immediate feedback. Students can practice over and over, then you can see their progress. Plus, Boom Cards™ can be played on computers, phones, and tablets with modern browsers, so students can use them just about anywhere. Click here for this FREE deck of digital task cards from my Boom Learning store. Before a quiz, you can suggest they use this to study from rather than printing out another set of words for them. Afterall, you already gave them the words, so why make twice the work on your part? This makes grading so much easier. Whether it is a project, an essay, a presentation, or a speaking task, using a rubric allows you to quickly grade the key components of the assignment without getting too caught up in the little mistakes. Remember, you should be grading for the skill you are assessing, so don’t focus on every little error. A rubric will help you stick to the concepts you are working with. 7. Pick a designated grading time and stick to it. For me, if I don’t have a set time to do it, it just piles up. So every year, I decided on a time that I would stay late and grade, and I just blocked that afternoon off. I would shut the door to minimize interruptions so I could really focus for one hour. Once I began using some of the methods above, I was able to finish the majority of my grading for the week in that one hour. Yes, I sometimes had long tests and projects to grade, but since that didn’t happen every week, I wasn’t burned out. It was manageable, and that is the goal, right? What about you? Do you have any great ideas for saving time? Leave them in the comments below!